Wish you could relive your childhood? Looking for a bit of nostalgia to help make the work day a bit sunnier? Then look no further than Screamers Archive. The creator of the site has such a passion for all things cool - especially from the 70’s & 80’s! The site is a treasure trove of cartoons, movies and toys and you will be sure to find a priceless gem of days gone by that will make you exclaim “I remember that!” with great enthusiasm. I enjoyed seeing the great movie posters of my youth - Goonies, Jaws and Gremlins. Goonies never say Die! Plus, a whole section on cartoons that remind me of many afternoons spent in front of the TV watching fantastic shows like Thundercats, Voltron and Jem (she’s truly outrageous!) Are you a classic gamer and lover of such hits like Asteroids or Breakout? After visiting the arcade section of the site, you will be searching online for the nearest arcade to get your fix! You will be reminded of backyard days having epic battles between the Transformers and the Imperial Empire. Not sure who my money was on - Optimus Prime or Darth Vader? Enjoy this trip to your youthful past and check out Screamers Archive today! This week's featured site is a beautifully done photography website. Cameraflage Photography specializes in portraits, categories including Family, Kids, Newborns, and Maternity. Each section has a sampling of Cameraflage's work using attractive slideshows. 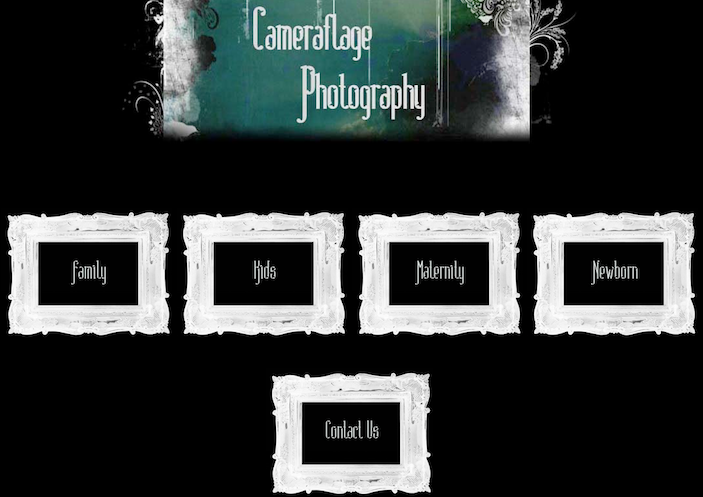 You can contact Cameraflage Photography by emailing them directly or connecting to them via their Facebook fan page. Check out their website and photography today! Today’s site highlights an amazing group out of Wharton, TX, who provide sanctuary to dogs who have been deemed “unadoptable” or have run out of time at a shelter. Jay Hellerich and Richard Clements have been making a difference in the lives of these unique animals since 1994 and have since bought a peaceful 37-acre farm to ensure there will always be a place for the dogs. Exploring the site you will discover how the sanctuary began and are able to learn more about the dogs currently at the farm. Though most of the dogs are there to live out the rest of their days, some are available for adoptions and you can learn more about these cuties. 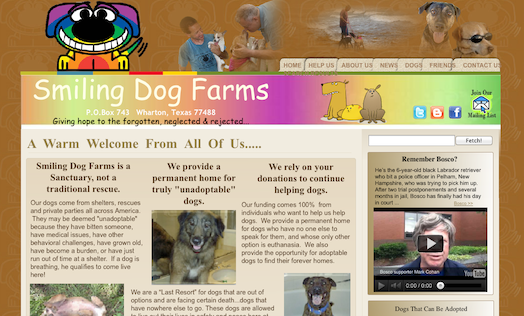 Plus, there is a whole section that details the various ways you can help Smiling Dog Farms. Take a few minutes to check the site out and support a wonderful and caring group! Looking for a talented bunch to handle the tunes for your next party? Want to find the perfect DJ for your wedding? 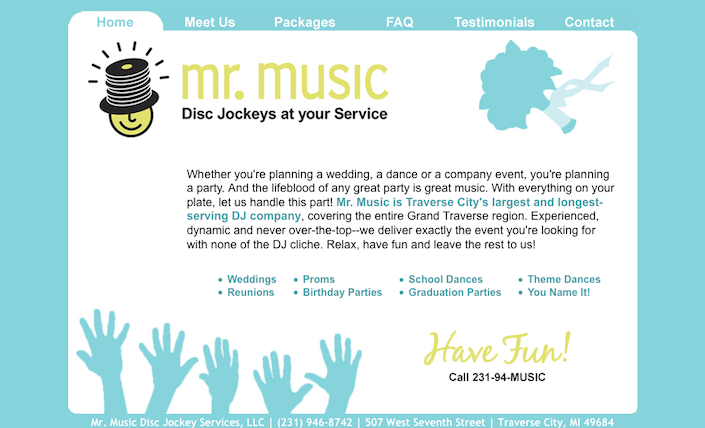 Then look no further than Mr Music, Disc Jockeys at your service! Mr. Music has many years of experience and they can’t wait to make that special event unforgettable. Their easy-to-navigate site provides excellent information like packages offered, frequently asked questions and testimonials – exactly what you need to make the right decision. Their friendly and quirky staff ensures you relax while they do all the hard work thus creating the best party atmosphere possible. Don’t wait – check out Mr. Music today and get ready for some great tunes and fun times! Vintage has been in style recently and where's a better place to buy vintage than an antique mall!? 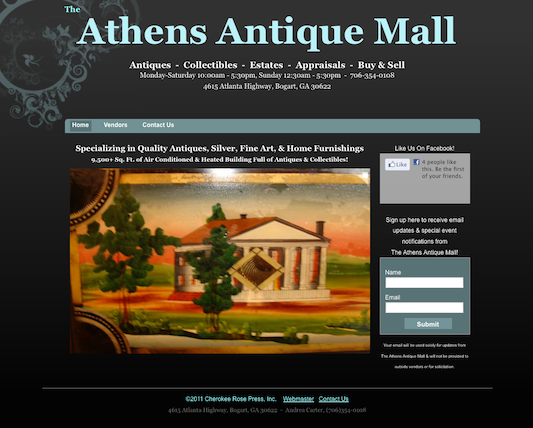 The Athens Antique Mall buys and sells antiques and collectibles. The site uses the photo album to display images of the different antique offerings that you can flip through. If you're in the Bogart, GA area, stop by the 9500+ square foot building to see what treasure you can find! Or maybe you have an antique treasure of your own that you want to make some money off of - stop by to see how much it's worth and sell it to Athens Antique Mall. You can sign up to receive email updates and news about special events right on their home page. Visit theathensantiquemall.com today! If you want your site to be featured here next week, submit it at featured-site.angelfire.com! Like Science Fiction? Why not support a fellow Angelfirian by buying his books on Kindle, Nook, PDF, or Paperback or read his screenplay! G.R. 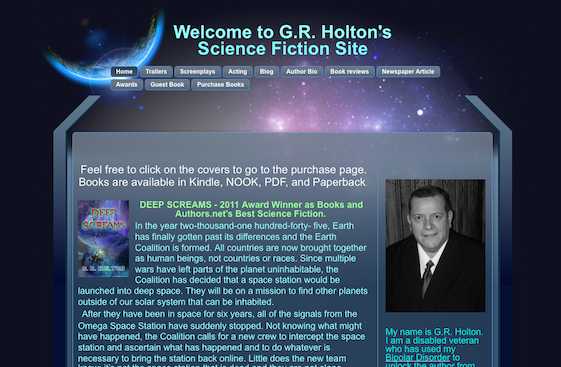 Holton has a love of science fiction and uses writing as a form of therapy. Not only has G.R. written science fiction books (e.g. Deep Screams & Soleri), but he has also written up a screenplay which you can read a synopsis of on his website, and he has also acted in "12 Angry Men" as Juror #5! Don't just take our word for it - you can read plenty of book reviews of G.R's books on his website as well to help you make the right choice of which book to read first! G.R. Holton has even created the book design for Cameron's A to Z of which all royalties go to Habitat for Humanity. Support G.R. Holton if you love Sci-Fi or if you just appreciate an outstanding person such as himself! Visit his site at GRHolton.com. I love Shiba Inus but I have heard that they can be hard to raise or live with. Shiba Inus are beautiful dogs which originate from Japan that have strong personalities. On http://www.mymsinshibas.co.uk you can read all about the webmaster's history with Shibas as well as great tips for living with and caring for Shibas. You can also find out some interesting facts about Shibas in the "What If?" section. For example, did you know that Shibas are highly in tune with you when you're pregnant and may even know before you do!? Weird! 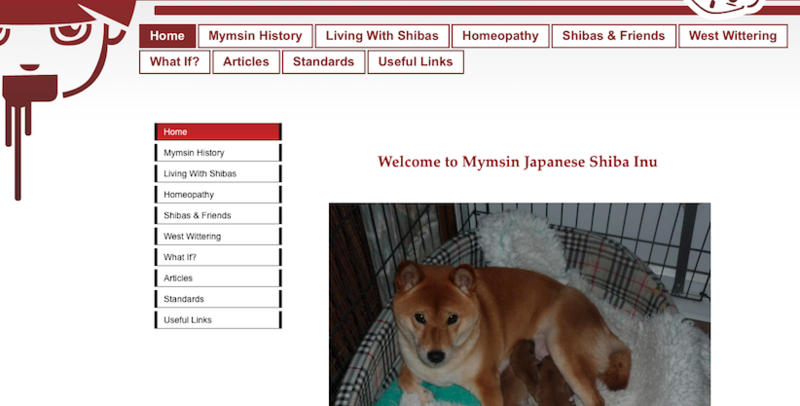 And then of course, the best part of the website, looking at the many, many pictures of the Shibas! Have fun! If you want your site featured here next Friday, submit your site at featuredsite.angelfire.com! 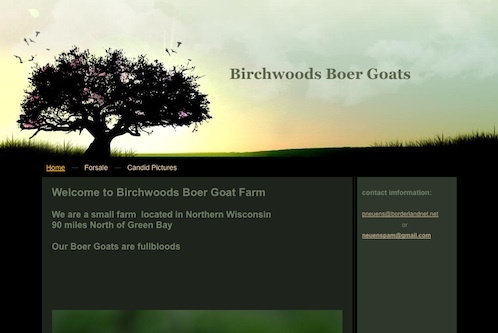 Today’s Featured Friday Site is Birchwoods Boer Goats. This small farm located in Wisconsin features Ottis and Rudy, who are full blood bucklings that are for sale and looking at these photos how could you resist! If you ever thought of owning a goat or love those little eating machines check out this site today!